View Poll Results: What is the coolest muscle car? Obviously people's definitions of "musclecar" vary widely. - 1970 Chevelle SS454 LS-6. The LS-6 had four bolt mains, forged crank 11:1 compression, solid lifters, rectangular port big valve heads, aluminum intake, Holly 4 barrel and 450hp. Make mine Cranberry Red with an M-22 rockcrusher and 4.10 gears please. I love Eleanor... or any variation of the Shelby GT500. I also love the 1st and 2nd Gen Trans Ams. 1967 Chevelle anyone? Cant bust one with a 454, muncie m22 rock crusher. Most beatiful car ever made. after that i would say 1970 Elcamino, ive got one with stroked 350, and id put it up against any hemi any day. Well you could, but you'd lose. '67 Chevelles are nice, but they never made one with a 454. Top engine would have been an L-78 396 (375hp rating) although there are conflicting reports about whether or not any were made in '67. The L-34 (350 hp rated) 396ci would have been the next most powerful engine available. What do you think is the coolest muscle car? tell me about it. can't beat for head turns, chick drooling magnet, performance, looks, comfort, style, and just driving, punchin' around town. HemiCuda for me...such power and style...hotness! These are the 5 cars in my opinion are the cars that scream MUSCLE CAR the most !! I gotta agree with WeaponR...his pic on page 1 says it all: Shelby Mustang GT500. 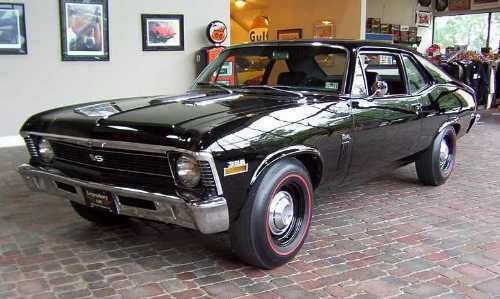 I vote for the '70 Nova L78 (396 ci/375 hp), black on black, buckets, 4-speed. Oh wait... that's my car! Well... This is akward. I feel ripped off. Last edited by DodgeRida67 : 03-20-2005 at 09:55 PM. Mines not even on the list. Oh well. Not what I was refering too.... I ment your username. Compare mine and yours for a minute.